Sweetology: White Chocolate Champagne Scones with Champagne Rose Icing ~ Happy Tea Party Tuesday! scone recipe and just adding/substituting from there! I was so proud..and excited! be just lovely together....and I was RIGHT! compliment to these delish treats. Preheat oven to 425°. Line 2 baking sheets with parchment paper. Set aside. In a large bowl, sift together the flour, sugar, baking powder, and salt. Add white chocolate chips. Using a pastry blender, cut the butter into the flour mixture until mixture resembles coarse crumbs. In a small bowl, whisk together 1/2 cup cream, egg, and champagne until combined. Gradually pour cream mixture into flour-butter mixture, and stir until dough just comes together. Transfer dough to a floured surface, and lightly knead 4 to 5 times. Roll dough to 1/2-inch thickness. Using a heart cutter, cut scones, re-rolling once if necessary. Bake for 8 to 10 minutes, or until golden brown. Transfer to a wire rack to cool. In small bowl combine and whisk until smooth, drizzle over scones! YUM! For a link to my recipe (printable) click HERE! lovely Rose cup, so delicate and sweet! treats I plan to share this month. FUN. LIFE before blog, never blog before LIFE. Thanks for linking up - I always enjoy what you bring to TEA! champagne rose icing look so sweet and yummy, they are adorable! Your Grinch cookies over the holidays are the cutest Christmas cookies I've ever seen! So cute and clever! Hope you have a great week! Thank you so much for hosting the party! If I wasn't on my health/fitness regime, I would sprint into my kitchen to make these. You had me at white chocolate and champagne. I am so happy to be joining you this week as it has been a while. I just adore your rose teacup and your heart scones look scrumptious! Mmmm, these look fabulous! So pretty and elegant too! Nice! That is hilarious, is that "your" James in the comment above! Ha! Love it!...Well, I too am very enjoyed for this site! I am so glad I was the lucky taste tester of these delicious and unique scones! They are a MUST bake for Valentines Day!!!! What beautiful scones! Bravo, bravo (insert clapping sounds)! Trisha, your scones are so pretty and I bet tasty too. They would be lovely for a Valentines Tea. Cute teacup! You did a fabulous job! I love the look of these little cuties! Thanks for hosting! Those scones sound delish. I was wondering what to make with leftover champagne...now I know! Hope you have a blessed week! Thanks for hosting! Wowee Kazowee! These scones are beautiful! I just have to keep scrolling back up and looking at them! Such a fun and romantic tea party! Thanks for hosting! These scones look delicious and perfect for a Valentine's tea. Aren't you smart to find a way to use leftover champagne. Hi Trisha, I'm new to your blog party but wanted to share my kiddy tea! I am so anxious to try your scone recipe for a valentine's tea. Thanks for sharing it, I'm going to print it! so pretty Trish! love them!! Thanks for hosting. The scones look delicious! Now aren't you the creative one!! I love the heart shaped scones and they sound so delicious. And teaming it with a Nutcracker Suite Tea is perfect. Yes, I will also miss Wanda Lee and Pam. You little sediment concerning life and blogging is so profound. I wish them all the best and hope to see them again some day. Your heart scones are absolutely beautiful! Trish - You are too clever by halves!!! Love Mr. Groundhog and such a sweet heart!! Oh! How I would love to partake like I used to. Unfortunately, Ed has been diagnoses with high cholesterol and his sugar count is high enough that he has to do a diabetes work-up. My gluten and dairy issues continue to take all the joy out of chocolate cake and sundry pastries. We are changing diet and lifestyle in a big way. Hoping to explore teatime options that fit our changing life so all is good. Any tips in this direction??? Kudos to you for coming up with the wonderful recipe for scones and icing and for creating such pretty scones. They do look delicious. Your goodies for tea are gorgeous, as always, Trisha! Whow, Trisha, your scones look fantastic. I am sure I will lvoe them as I am very fond to all rose recipes. Thank you so much for sharing this yummy creation. What a lovely idea! They are perfect for Valentines day. Leftover champagne?? Never heard of it! :-) Your scones do look and sound delectable -- and perfect as a Valentine's Day treat! Very unique and I love the heart shape. Happy Pink Sat. Oo,those look delicious! And they are beautiful as well. omg yum! visiting via french country cottage. Those scones look delicious. I've never made scones before but definitly want to try these. 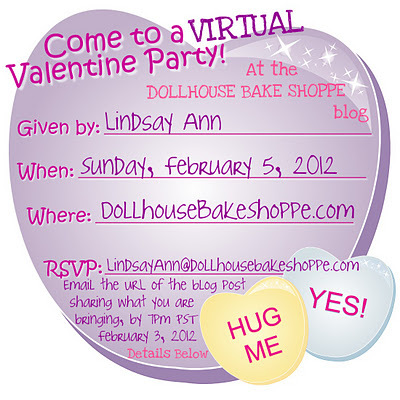 Coming to you from Dollhouse Bake Shoppes Virtual Valentine's party.